Here's a brilliant recipe I discovered in an old 1970's book on French Regional Cookery. Jambon au Cidre. Ham with Cider. It comes from Le Manoir d'Hastings, a hotel found in a 17th century priory in Normandy. It's an old dish. I love the simplicity. You take a 3 kg ham and soak it in several changes of cold water for 24 hours. You then place it inside a large saucepan and pour in two bottles of cider, or enough to cover the ham. I would try and find a decent Norman cider, rather than using that sparkly, fizzy, sweet stuff. The pan is brought slowly to the boil and any scum skimmed off the top. The heat is lowered and the ham simmered very gently until tender. About two and a half hours. 20 minutes per ½ kg. Once done, the ham is left to cool in all that lovely cooking liquor. And now for the interesting bit. Slice the ham and sauté the slices in a frying pan, in unsalted butter, until they get a little bit of colour. Transfer the cooked slices to a serving dish. To make the sauce, déglacez the pan with six tablespoons of Cider Vinegar, add 250ml of the reserved cooking liquor and reduce over a brisk flame until syrupy. Taste, and season with salt and white pepper, if needed. Whisk in a knob of unsalted butter, which will give your sauce a nice glaze. Pour over the ham slices, garnish with finely chopped flat leaf parsley and serve. I could have have called this post 'A Tale of Two Restaurants'. I'm standing at the upstairs bar of Village East, Bermondsey, a stone's throw from The London Dungeon. I've been standing there for a very, very long time. Waiting to be served. Both the barmen think they're Tom Cruise in 'Cocktail'. They're spinning martini glasses into the air, pouring liqueurs from great heights, working the till with hip gyrations- as if they're dance extras in Saturday Night Fever. It's all slightly embarrassing, and to be frank, a bit of a yawn. They think they're cool, but as my 10 year old niece- going on 19- would say 'are so totally not'. To my right are two boys; skinny creatures with straggly beards. They pick up on my raised eyebrow. I ask them what they're drinking. The barman's making patterns in cocoa on the surface of their brownish coloured cocktails. Espresso Martini, they tell me. Vodka flavoured with Coffee. They sense my disapproval, and shunning me, like some ostrasized beast, turn away in unison. This is not my place. The strange thing is that I don't think it's got anything to do with my late youth. I don't think I would have liked it even if I had been twenty years younger. Dear old Claudio at Harry's Bar. I can't imagine him serving an Espresso Martini or keeping thirsty clients waiting for fifteen minutes as he shakes his way through a Cucumber Mary. Still, I feel rather at home in Bermondsey, with its narrow cobbled streets, and Hogarthian vibe. It's a bit like being in a Leon Garfield novel. Bill Sykes's manor. It has the feel of an English country town- with The Shard standing in for a church spire. We meet up with an old, and discriminating friend, Michael, and move on to Casse-Croûte, a few doors up. It's a tiny French restaurant with a very different integrity; all red checked table cloths, Charles Trenet crooning on a bakelite radio, stained Absinthe posters (actually I made that up, but there could have been). The problem with this sort of place is that it can almost become a caricature of itself. A caricature of 'le zinc'. The nictotined ceiling has been painted in burnt umber, all of six months ago. It's never seen a Gitanes in its life. The young chap who serves us sounds French. Very French. Lots of Zzzz going on. You almost expect him to drape onions around his neck, wear a striped Breton shirt and to radiate garlic breath. Not that I would dream of stereotyping anyone. How d'you say? I've been rabbiting on about French food for years now, and Casse-Croûte is a welcome return to the delights of simple French cooking, presented well. I detect a trend: there's Jeremy King and Chris Corbin's Zédel, their Colbert in Sloane Square and Joel Kissin's newly opened Boulestin in St James's Street, which I've yet to eat at. The restaurant, of course, is packed out, with a very mixed crowd. We make friends with a young couple at the next table. A pretty girl with peroxided blonde hair and yet another scrawny beardy type. Kenny Everett springs to mind. I admit to her that I write a food blog. She seems reasonably impressed but my cover's blown when she sees my iphone- It's one of the older types, slimmer, more streamlined, with a touch of Deco, but to her eyes this went out with the ark. My 'hip' status plummets. 'I think you'll find', she says, 'that the so- and so- iphone, Model XZY takes much quicker photographs.' The Kenny Everett association vanishes when they start canoodleing at the table. We return to the food. Mrs Aitch had the goats cheese salad, which was served luke-warm, almost cold. She looked a little bit disappointed. Michael ordered the creamy mussel soup: it tasted good, but was certainly not generous: the helping was definitely on the mean side- but with these sort of prices they're going to have to cut corners somewhere, aren't they? I had the marinated red mullet, which was subtle and hit the spot. This came with a simple green salad, nicely coated and tossed in dressing. So far six or six and half out of ten. The main courses were much better. Mrs Aitch had hake with a white bean pureé. It was excellent. The fish was cooked perfectly, and the beans made a jolly alternative to the dreaded mashed potato. Michael ordered a classic pork tender loin, again perfectly cooked, with creamy mashed potato. I had a slowly cooked beef daube, in a glossy rich, beefy sauce, served with pearl onions. It was excellent, well presented and generous. For pudding, the pear tart was fine. Mrs Aitch enjoyed a gooey dark chocolate pudding which was a 'fix' and 'hit the mark'. But another grumble was the coffee. We expected it to come black, with, perhaps, a tiny jug of milk, but instead, were given creamy cappucinos- almost insulting- as if this was the sort of plebian coffee les rosbifs enjoyed after dinner. I'm a fully signed-up black coffee drinker and although I can just about stomach a cappucino at breakfast, it's the last thing I want after a rich pudding. I like Casse-Croûte, I do. I admire their simple menu, it's great value (around £35 a head, including wine). The food is cooked well and looks professional on the plate. They most certainly know what they're doing in the kitchen. But at these prices they're going to have to cut corners somewhere, and this shows in the slightly disappointing first courses. And for such a small restaurant, service is erratic, quite probably Lost in Translation. And, through no fault of its own, it lacks that authentic patina created by the greasy vapour of twenty thousand French cigarettes. Two and Half Cheers for Casse-Croûte! Booking is essential. You may have had céleri rémoulade in France- it's that ubiquitous (but delicious) salad dish you'll find in charcuteries up and down the land; frankly, not dissimilar to the American coleslaw. The "celeri" bit is shredded celery root. The "remoulade" is a mustard-flavoured mayonnaise or dressing. Take a large, sharp knife and slice off the brown, knobbly skin. You'll find that the celeriac turns yellow with exposure to air, so you will need to work relatively quickly. Cut the celeriac into large chunks and then shred it in your food processor. I've finally mastered the art of working mine, and like to shred things very thinly, so that you end up with delicate, tiny strands. It's very satisfying for some reason. Dump the shredded celeriac into a bowl, and immediately mix in some fresh lemon juice and sea salt. This will stop the celeriac from turning yellow, in effect, keeping it white in colour. Now for a bit of conjecture. How to make the rémoulade dressing? Some recipes call for a simple mayonnaise, seasoned with salt and pepper, and flavoured with a large dollop of Dijon mustard. And that's what I used the last time I made céleri rémoulade (adding a tablespoon of boiling water to the mayonnaise to lighten the colour and give it a lift). But to be completely honest, even then I found my home-made mayonnaise to be too rich, too thick, even slightly cloying in taste, swamping the subtle taste of the celeriac. In his excellent blog, Living the life in Saint-Aignan, Ken Broadhurst suggests that to achieve that genuinely authentic charcuterie taste, half the dressing should be made from the mustard-mayonnaise and the other half from crème fraiche. This might well be the solution. I've also noted that Julia Child used an eggless mayonnaise, by slowly dripping boiling water into a dollop of warm mustard (so that it forms an emulsion), and then adding the oil (in the usual way) bit by bit, finishing it off with a tablespoon or so of white vinegar, and a seasoning of white pepper and salt. This eggless "mayonnaise" is then mixed in with the shredded celeriac, with chopped parsley and sour cream added to taste. I like the idea of this version. By the way, I found that the céleri rémoulade improves if left over-night to marinate in the 'fridge. The lemon, salt, and mustard helps to "cook" the celeriac and removes that raw taste. First, heat up your oven to 200∘C. Crack three eggs into a bowl, and add 150g of white sugar. Using an electric beater, whisk until the eggs and sugar form a white, creamy and reasonably stiff "cream". In a small pan, melt half a pack of butter, and then set aside to cool down. Sift 150g of white flour into the beaten eggs and sugar, and pour in the melted, liquid butter. Using a spoon, very slowly and gently fold in the sifted flour and butter to form a batter. Now's the time for the flavouring. Last week I used a teaspoon of vanilla extract and that worked reasonably well. You could also use lemon juice. However, yesterday I decided to give my Madeleines an orangey tang- and this seemed to work best of all. So, mix in the finely grated zest and juice of half a small orange. Next, you'll need a Madeleine baking tray. I managed to find mine without any problem- and any decent, reasonably upmarket kitchen shop should sell one. It's a tin baking tray with twelve scallop or shell shaped molds. Brush the molds with melted butter (I dipped my brush into the butter I had previously warmed up). Pour the batter into each mold. Surprisingly, you will find that the Madeleines don't expand that much during baking, so I would level off the batter in each mold, making sure that the "scallops" are properly filled. Bake in the hot oven for about nine minutes- until the Madeleines are a light brown and golden colour. Take the molds out of the oven and let them cool down slightly, before turning out the Madeleines onto a plate. Sprinkle them with sifted icing sugar. I found that as the Madeleines cooled down, the outside bit became crunchy and slightly caramelised, while the insides remained soft and slightly moist. Last week I managed to save a complete set of the 1968 Cordon Bleu Cookery Course, all 72 of 'em in a near mint condition. A friend at work was about to chuck them away into the skip. They make fascinating reading: a time-warp into a familiar, but very different age. I'm amused by the photograph from the very first issue, which I've posted above. A youngish couple are having the in-laws to dinner. For the first time at the new flat? There's bound to be a bay tree and carriage lamp outside the glossy front door. Daddy's very much the silver-haired roué, the clubbable chairman (something in plastics?) Bet you anything he drives a Jag, and keeps a mistress holed up in a tiny flat in Dolphin Square. He's holding forth while his long-suffering wife (Jackie Kennedy shift-dress and pearls), sits patiently "Yes, Dear, No, Dear, Three Bags Full, Dear". Youngish Hubbie looks like an International Man of Mystery; probably a thrusting young exec. If he plays his cards right, Daddy might get him a directorship at the family firm. Our heroine's a secretary at some fashionable advertising agency somewhere. J Walter Thompson? Though God Knows how she finds the time to cook: the Cordon Bleu Cookery Course is quite clearly aimed at women who don't go out to work; the draconian instructions include a precise timetable for operations: 8.43am Light the Oven, 9.59am Truss the Chicken. That sort of thing. The couple's London pad is slightly trendy- the Victorianesque French Horn print is very Conran. And what is she gazing at so proudly? 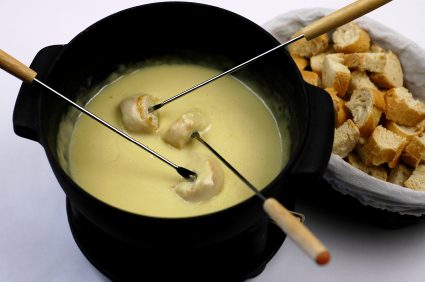 It's none other than our old friend, Chicken Véronique! Here's how to make the dish, with precise instructions from the Cordon Bleu Cookery School, 1968. First, you need to season the inside of a trussed chicken, but are not allowed to season the outside, as the salt will "draw out the juices, and prevent browning". (Hang on! Is this really true? Simon Hopkinson does. Not sure about that one). The trussed bird will keep its shape, and be easier to carve. (Yup, that sounds right). Next, you rub the chicken with butter, and put 3-4 sprigs of tarragon inside, along with a further nut of butter. The chicken is placed in a roasting tin, with ¼ pint of chicken stock, covered with buttered paper, and roasted for an hour at 400 F. After the first 15 to 20 minutes, the chicken should be removed from the oven and basted; and then basted again after another 15-20 minutes, turning the chicken around, each time. The buttered paper should be removed a few minutes before the end of the cooking, to brown the bird. The hot chicken is then removed to a wooden board, jointed and carved. 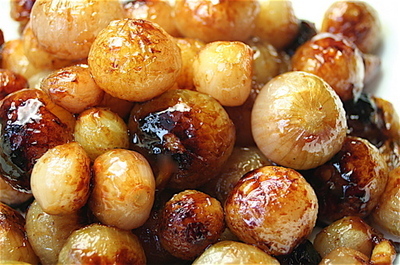 The remaining juices in the roasting tin are reduced over a steady heat until "brown and sticky". Another ¼ of a pint of chicken stock is added to the pan to make a gravy, which is then strained into a small saucepan and thickened with ½ teaspoon of arrowroot mixed with a tiny bit of water. (Add the arrowroot mixture away from the heat, and then stir until boiling). Two tablespoons of double cream are stirred into the gravy. Peel and pip some white or muscat grapes (you can blanche them in boiling water to help the process), and drop them into the gravy. The chicken pieces are arranged on a silver-plated oval-shaped serving dish, the gravy is spooned all over it, and the grapes arranged all over the chicken. The remaining gravy and grapes (not sure about keeping the grapes in the gravy, very odd) are served separately in a sauceboat. Hmmm. Chicken with Gravy. Served with Grapes. What do you think? The way forward, or a definite step backwards? If you're looking for a side dish that's slightly different, this is the perfect recipe. It's similar in style to "Vichy Carrots", which are glazed baby carrots cooked in a bit of sugar and mineral water from the Vichy area of France. Buy or dig up some baby onions. You could also use shallots, but I think the baby onions will hold their shape better. In a small pan, saute them very slowly in butter for a minute or so. Next, add some meat stock, salt and pepper, and two teaspoons of sugar. The idea is to braise the onions, so you want your stock to come only half-way up the onions. If you're going to add the fizzy water, now's the time to do it, but I'm not entirely convinced that anyone (unless they have super developed taste buds) is going to be able to tell the difference here between using tap water or Vichy water. After all, there's quite of bit of other stuff going on in there, the sugar, the salty stock, not to mention the onions themselves. Dunno. Cook gently, so that the stock combines with the sugar and butter, and forms a syrup. Make sure that the onions are well coated; and carry on cooking until the stock/syrup has been reduced. You're looking for nicely caramelised onions. If the heat is too high, they may burn, so watch out for this. Sad news about old Keith Floyd. If his more recent appearances seemed a bit contrived, world weary and lacking in genuine enthusiasm, his earlier programmes (such as Floyd on Fish and Floyd on France) were wonderful. According to today's Evening Standard, Floyd's last lunch consisted of: Champagne, Pouilly Vinzelles 2006, oysters, potted shrimps, Nature Perrin and Fils Conte de Rhone 2007, Red-legged partridge with bread sauce, and pear cider "perry" jelly. And who can forget Mimi of Biarritz and the correct way to cook piperade? It's simple. It's delicious. It's a classic of French cuisine. This recipe is almost fool-proof if you follow my exact instructions. Buy a slab of dark chocolate. Go for a chocolate with a high cocoa content (75% cocoa solids and above). I used a Swiss Lindt chocolate with over 85% cocoa solids. Melt it very slowly in a double boiler (ie a bain-marie) with about four tablespoons of water, until it's smooth and shiny. Make sure the chocolate remains warm, rather than hot. Remove it from the heat. Next add two tablespoons of unsalted butter and a tablespoon of crème fraiche. Mix them in very slowly. Now it's time for the eggs. Take hold of three eggs (kept at room temperature), and separate the yolks from the whites. Add the three egg yolks, one by one to the chocolate mixture. Stir them in very slowly. In a separate bowl, whisk up the remaining three egg whites. Make sure that the bowl is clean, and there is no trace of egg yolk, otherwise the whites won't get stiff. Whisk them until they are form stiff peaks. Add a pinch of salt, and a tablespoon or so of fructose or white sugar. This will give the egg whites a lovely gloss. Now for the fun bit. Add a dollop of the stiff egg whites to the chocolate mixture and stir it in very, very gently with a metal spoon. You need to hold your spoon as if it was a feather. What you don't want to do (as I did the first time I attempted this) is to stir it briskly. The lighter your touch, the lighter your mousse. It's a fine art. Slowly stir in the remaining egg white. Divide the mixture into ramekin dishes, and place them in your 'fridge for at least three hours. If you're in a cheffy mood, you can pipe the mousse into the ramekins in arty swirls, as shown in the photograph. Decorate with shavings of white and dark chocolate. Eat. 500g Arran Victory (Waitrose Heritage Potato) or Maris Piper potatoes. 1) Peel and chip 400/500g potatoes, and then wash them thoroughly. 2) Boil a pan of large salted water. Add the chips and return to the boil, and then reduce to a gentle simmering for ten minutes. 3) Remove the chips from the water, and leave to cool on a cake rack. When cool, chill in the 'fridge. 4) In a heavy bottomed saucepan, heat 1.5 litres of groundnut oil to 130C. Using a wire mesh basket, fry the chips for nine minutes. 5) Remove the basket, and shake off the oil. Cool the chips on a cake rack, and then chill in the 'fridge for the second time. 6) Heat the oil to 190c. Fry the chips in a mesh basket for 2-3 minutes, until they are golden. Drain the chips, then spread them on a double layer of kitchen paper. Serve immediately. I'm quite curious about the food people ate in the Middle Ages. In The Big Fat Duck Cookbook, Heston Blumenthal mentions his fascination with a bizarre 14th century French cookery book, Le Viander de Taillevent, in which a chicken is plucked alive, basted with soya, wheat-germ and dripping to simulate roasting, coaxed asleep, and then 'brought back to life' at the table.